Annuity income at retirement has recovered since reaching an all time low in August 2016 after the Brexit vote and is now up to 18% higher following a rise in gilt yields. There has been a strong recovery in annuity rates since the EU Referendum when 15-year gilt yields reached an all time low in August 2016 of 0.90% rising 85 basis points to 1.75%. Annuities are mainly based on the change in gilt yields and an 85 basis point rise should result in an 8.5% rise in rates. 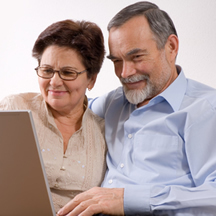 Annuity rates have increased by 18.6% for those aged 65 buying a single life, 3% escalating annuity and on average are 12.3% across the board for standard annuities. 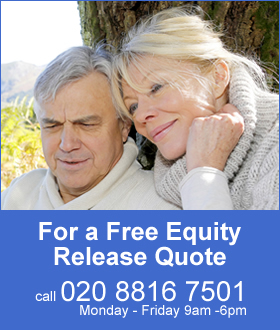 Smoker and enhanced annuities are higher by a smaller amount of 8.5% over the same period with the highest rise is 12.5% for those aged 65 buying a single life, level and for those aged 60 buying a 50% joint life, level annuity. Whereas enhanced rates have matched yields, standard rates have exceeded what we were expecting. Where there is a combination of both annuity rates and equities rising, those people that remain invested before they buy an annuity can benefit significantly. 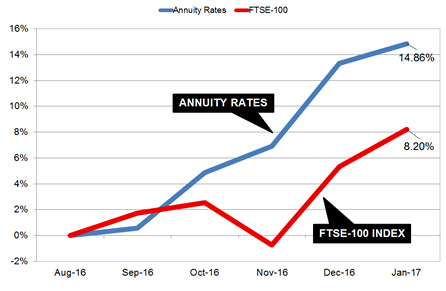 The above chart shows how the FTSE-100 Index and annuity rates for our benchmark example have increased since August 2016 after the EU Referendum. Our benchmark example for a person aged 65 with £100,000 buying a single life, level annuity would receive £4,696 pa in August last year rising by 14.86% or £698 pa to £5,394 by the start of February. For those that remain invested before buying their annuity, the combination of both rising rates and equities has resulted in a significant rise in annuity income. A pension fund reflecting the FTSE-100 index would have increased by 8.2% since August 2016. For example, a fund value of £100,000 at this time would offer an income of £4,696 pa. The fund would now be £108,199 and with the rise in rates for our benchmark example the income from this fund would be £1,140 pa or 24.2% higher at £5,836 pa. In terms of lifetime income, the Office of National Statistics (ONS) would expect a male to live for 17.3 years and he will have £19,836 more over his lifetime. For a female she can expected to live for 20.4 years increasing her income by £23,256.